NOTIFICATION: Maharashtra Education Society (MES), Pune inviting online applications for filling up 205 vacant posts of Assistant Teachers for various classes spread all over Maharastra from eligible and interested willing candidates. It is latest & good information for unemployed personnel those who are looking for these new Jobs in Government sector & other organizations. Job seekers, who wish to apply for these vacancies regarding ED Maharashtra Recruitment 2019, must have passed UG, PG, D.Ed, B.Ed or equivalent with a required experience if asked. Applicant’s upper age should be as per Govt rules and age relaxation is applicable to all reserved category candidates i.e.SC/ST/OBC /PWH/Ex Servicemen /Women candidates etc. To be getting selected in this organization screened candidates will have to pass in interview and document verification conducted by authorized officials. Selected candidates will be paid a handsome salary (Basic Pay + Grade Pay + DA + other applicable usual allowances) as per Govt rules. Selected candidates will be called for joining the organization as per rules, for that they must always remain in contact with the organization and must visit official website for daily updates, because most of organization have uploaded their all activities on internet. All willing candidates can apply through online mode. MES Assistant Teacher/Shikshak Recruitment 2019 for 205 Vacancies. 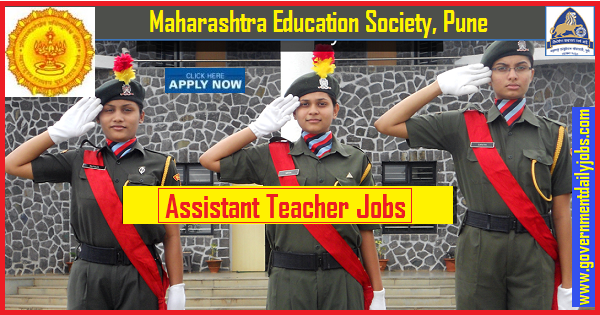 NO OF VACANCIES: 205 vacant posts Assistant Teachers in Maharashtra Education Society (MES), Pune. EDUCATIONAL QUALIFICATION: A passed of 10th, 12th, UG, PG, HSC, D.Ed, B.Ed, M.Sc, M.Com, MA, BA, BA, B.Sc with B.Ed or equivalent from any recognized Board/Institute. PAY SCALE: As per MES rules. AGE LIMIT: As per MES rules for MES Recruitment 2019 Apply Online for 205 Assistant Teachers Bharti. REQUIRED APPLICATION FEE: For said vacancy a non refundable application fee is to be paid by the candidates as per rules. Refer notification. General Awareness Questions and answers for Bank Exams. Students, who are in process of preparing to get success for Government job, can download this previous question paper with their correct answers. SELECTION PROCESS: Applicants who are screened for applicability/ eligibility are being selected as per organization policy/rules depending on the basis of their performance in interview and docment verification. HOW TO APPLY: For said posts (MES Recruitment 2019 Apply Online for 205 Assistant Teachers job) eligible, willing and interested candidates may apply through online at official website up to last date. Applicants must retain a hard copy for future reference. 2. Find out Notification for Recruitment of Assistant Teachers (Prathmik Shikshak) Posts in MES Maharashtra 2019. 3. Download the Official Advertisement and read it carefully. 4. Select Apply Online link given in Official Notification to open Online Application Portal. 5. Register yourself and Login with your Registration Number and Password. 6. Fill in Online Application Form with your personal, communication and educational details. 7. Upload your recent passport size Photograph, Signature as mentioned. 8. Upload mark sheets, documents and certificates as asked. 9. Pay the Application Fee through Online Payment Mode. 10. Print E-Receipt after successful payment of Fee. 11. Submit the Application Form online on completion of filling up. 12. Save your Registration Number and Password for future reference. 13. Take a printout/hard copy of Application Form for further reference. स्टेट बैंक ऑफ इंडिया ने 8904 क्लर्क के रिक्त पदों को भरने हेतु आवेदन आमंत्रित किए हैं इच्छुक एवं योग्य उम्मीदवार यहाँ से आवेदन कर सकते हैं। आवेदन पूर्व सभी सूचनाएँ यहाँ अवश्य पढ़ें। 8904 vacant posts of Junior Associate (Customer Support & Sales) in Clerical cadre in State Bank of India (SBI). Last Date: 03-05-2019. CONTACT ADDRESS: Maharashtra Education Society (MES), Pune, 1214 -1215, Sadashiv Peth, Pune, Maharashtra, 411030, India/ Phone: 91-020-41038100. CONCLUSION: Maharashtra Education Society (MES), Pune, invites online application for the recruitment of 205 vacant posts of Assistant Teachers on regular basis from Indian residents who are eligible & interested; candidates can apply through online application. LAST DATE TO APPLY: 20-04-2019 for MES Recruitment 2019 for 205 Teachers Posts.